Bead Release storage, hidden under the kiln out of direct sunlight. In Part 5 of the Studio Set Up blogs I discuss tips and tricks for getting your mandrels prepared. This blog focuses on three main areas, making bead release, dipping your mandrels and cleaning your mandrels. Now that the torch is set up and the studio is looking more like a work space the invitation to melt glass is calling. If you’re beginning this craft, don’t underestimate how important good mandrel preparation is. Mandrel prep is the first step to do before you can make beads. There are a lot of different brands of bead release on the market, more than likely a pre-made blend will suit your needs. If you’re in Australia and you’re not satisfied with the local stuff that may mean spending some large sums of money to get a mix from the US. I’ll let you in on a bit of a secret, if you get to understand how bead release is made, making your own is pretty awesome. In Part 4 of the Studio Set Up blogs I discussed turning on the torch safely and where to get the fuel needed, however having a torch and studio is useless if you cannot get your bead release correct. One of the greatest pains in the backside for any bead-maker is bead release that doesn’t do what you want it to do. This blog should help you create good habits for either making your own bead release, preparing your mandrels and, or keeping them in tip top shape to make sure you’re getting the most out of your gear. Mandrels are rigid stainless steel wires used to put the hole in the bead. They are coated with a clay and silica mixture, called “bead release”, which is a temporary clay agent used to extract the bead from the wire mandrel. You can make your own mandrels and bead release or buy these products ready to use. I don’t cut my own mandrels because I find it really time consuming. If you’re in Australia you can get Stainless Steel 316L rod from BOC. 316L rod is the specific kind of stainless steel that you need for mandrels. The size most lampworkers use is 1.6mm and up (by far the most popular size is (3/32) 2.4mm). I really like the (1/8) 3.2mm for making bigger holed beads that fit round leather cord. These mandrel sizes will be roughly the hole size of your bead. If you have the tools lying around to cut your own mandrels, you may find it cathartic or handy to cut whatever size you want. If you’re like me and really can’t be bothered; mandrels are available at most glass retail outlets online and they’re inexpensive. Mandrels that are sitting in an annealer for long periods of time go softer quicker and bend easier, so you will replace them more frequently, because I batch anneal, my mandrels last longer. Never clean mandrels in the sink directly. Bead Release is 50% clay and it will clog your sink. 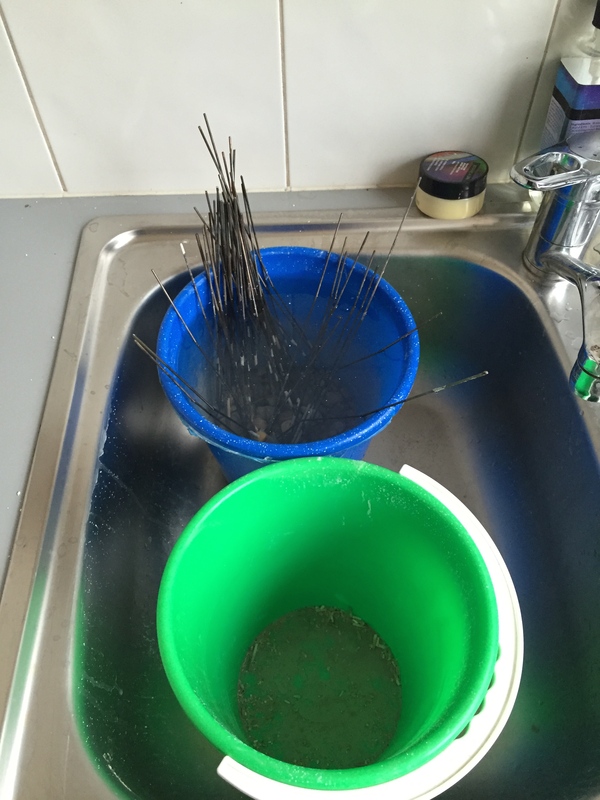 Clean everything in buckets, then tip the water outside into the garden. New mandrels are shiny and smooth and look lovely. You don’t want them like that at all. Bead release won’t stick well to a slick surface. The easiest thing to do is pull on some rubber gloves and give them a scrub with some steel wire and soap to rough up the surface a little and clean off any oils from being handled. If you have picked up some mandrels second hand you’ll notice they’re a nice brown colour. They turn this way after being fired a few times in a kiln. An introduction to Bead Release. There are so many different types and brands of bead release on the market today. There are two basic types “flame dry” and “air dry”. Some air dry release can also be dried in the flame. What this means is that for some releases your mandrel must be dipped and left to dry and other releases can be dipped on the fly and your mandrel can be dried in the top part of your flame slowly. Flame dry release needs to be dried very slowly at the top of your flame, otherwise it will explode off. Artists will advocate for their personal preference, but I’m not bothered by which type of release I use. I tend to dip my mandrels in the evening after I finish a bead making session as a sort of wind down activity. This means that I have dried mandrels ready for the next bead making session. Regardless of which type of release you end up going for they all contain about the same ingredients. Crucial ingredients are water, kaolin and alumina hydrate. 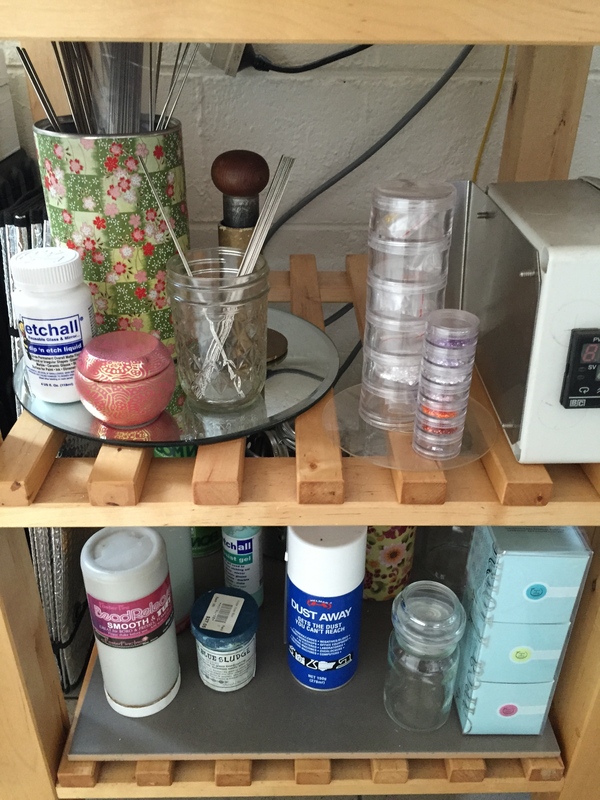 When I first wrote this blog post I wasn’t a big maker of my own bead release. I had most of the ingredients lying around to “fix” up batches that had gone wonky. These days though I rotate around between premixed pots from a variety of different sellers or I make my own. All the raw materials and different types of bead releases I own. I tend to accumulate bead release stuff. I have read a heap about bead release, I have experimented a lot with different ingredients and recipes. Subsequently I have a lot of notes from a long time ago (the notebook has yellowed from age) when I was so frustrated by failing release. This blog post is so very, very long because I explore some of what I have learned over the last 10 years. One of the things I’ve read is that alumina hydrate must be calcined for it to produce the best quality bead release. This means that if you’re buying alumina hydrate from a pottery craft supplier, you need to heat the alumina up to about 1200 degrees centigrade then let it cool before use. That’s a fair amount of effort and it requires a kiln. Whilst I believe that calcined Alumina Hydrate stops hairline cracks appearing in your bead release, at the end of the day it doesn’t particularly matter if it’s calcined or not. So long as you adequately dry your mandrels and heat them up properly before you wind glass onto them, you will be less likely to develop hairline cracks across your release. Thick and gluggy bead release looks like this. Why are there so many different types of Bead Release? There are a lot of different theories and recipes about bead release. It’s a beadmaker holy grail quest, in a sense. Finding that one perfect release that holds, never cracks, never flakes, where beads just come off mandrels easily and cleans out of holes perfectly. It doesn’t seem like such a big ask does it? Well… These days it is pretty easy to just buy good quality bead release. As the saying goes “you need to kiss a lot of frogs to find your prince”. Bead Release is a bit like that. You may find a brand that does all of that, or your brand used to do all of that and now something is wrong and you need a quick fix. One thing that is universal about bead release is that there are all different types and brands because humidity and heat effect it. You need to get one that suits your humidity levels, what someone recommends in Texas, might not work in Tasmania. The other thing about bead release is that it needs to have a good suspension of all its ingredients in the mix. Sometimes bead release that is pre-made can have batch runs that don’t suit your environmental circumstances and the dreaded cracking, breaking and “spinning beads” happen. One thing I try and do in this blog is to help you understand what might be causing the problems with existing releases as well as learning how to fix them, and making your own release if you can’t find a commercial one that suits you. Something else bead makers should be aware of is seasonal changes effect your bead release. Bead release that I have no trouble with in winter, is problematic for me in summer because the searing temperatures bakes my release and makes it go flaky, and I’m not just talking about what it does in the jar sitting on the shelf. For the new bead maker, you will work this out as you go and will more than likely have a few different pots of stuff lying around for different seasons. So don’t think that the first thing you buy just has to work because someone else says it does. The consistency of bead release should be like perfect pancake batter. 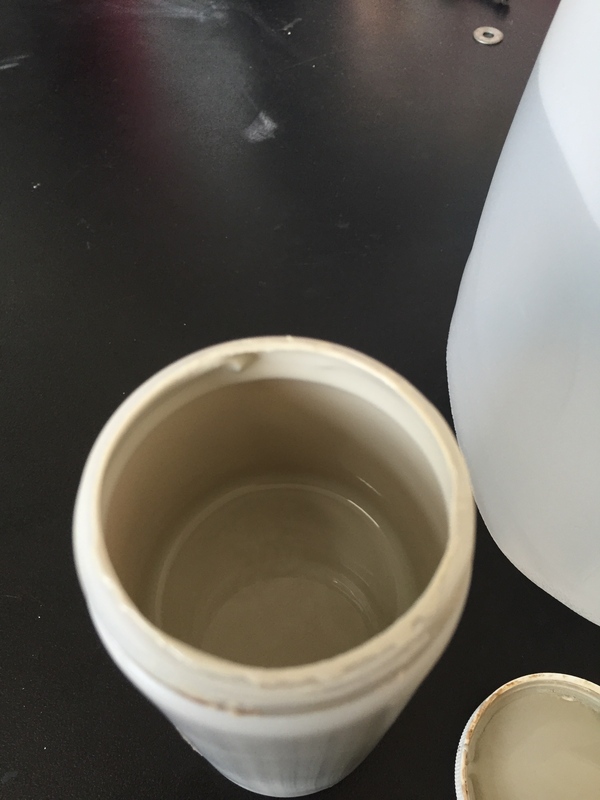 See the photo above to see what this jar looked like before distilled water was added. Should you be motivated to make your own bead release, here’s some of the more popular theories. Some people use Kiln Wash all on its own (kiln wash can be a mix of alumina hydrate and kaolin, but it could also be a mix of alumina oxide and kaolin). 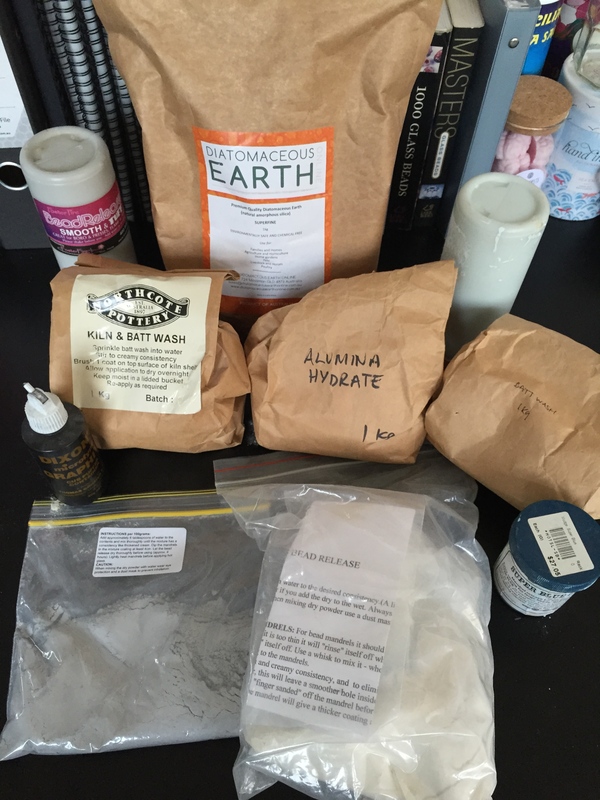 Some people add Bentonite Clay (available from health food shops) to pure Kaolin then mix with pure Alumina Hydrate. Then there are a few “optional extras” such as Graphite and Diatomaceous Earth that can be thrown in to stabilise the blend. There is a lot of sifting to make sure all the lumps are out and you haven’t even added the water yet. Then there are conflicting arguments about the perfect ingredients. Bead release is part clay and part other stuff. (Fancy technical term there) that holds under high heat but also can wash out of your bead in water. We’re asking it to do a lot, but that explains why it is mostly clay. There are other conflicting pieces of information online about bead release, such as you don’t have to calcine your alumina hydrate (you don’t). Kiln wash on it’s own is strong enough (it’s not), measurements are pointless (they’re not), tap water is fine, no – tap water is bad; only use distilled water. 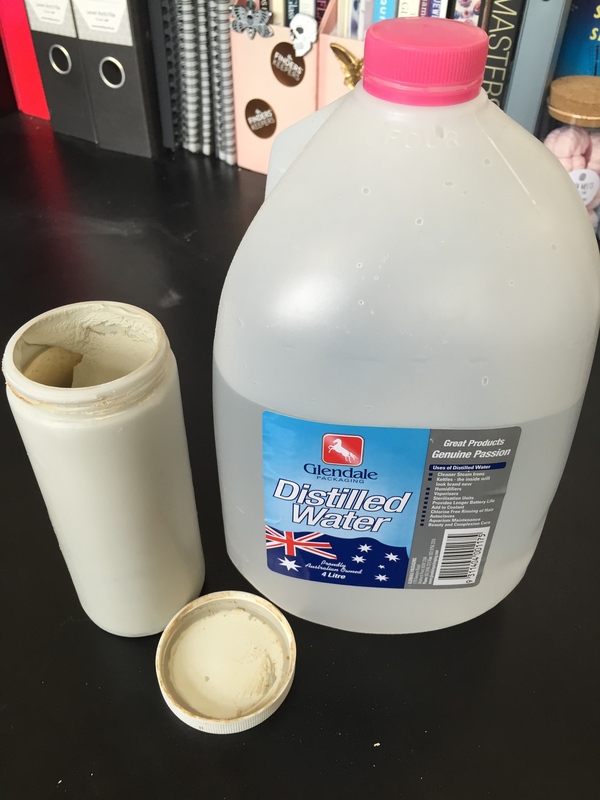 Distilled water is a variable you can control, if you’re using rainwater or tap water and you suddenly have problems with your release, after adding more water. That’s your problem there. I gave up trying to figure out how to make my own bead release after a few false starts (Edit: April 2015. I always give up, but then I go back and try things again). If you want to experiment, the ingredients I listed above are what you need or you can try this recipe below as a base line then increase or decrease the percentage of things as you go to suit you. All of the ingredients for bead release are very fine powders so wear a good respirator when making bead release otherwise those tiny particles will find their way down into your lungs. I’ve personally tried a simple mix of 50/50 Kiln Wash (Kaolin and Alumina Oxide based kiln wash) and added Alumina Hydrate with a good chunk of graphite. This isn’t a bad mixture, but it won’t work in presses or if you’re tugging at the glass. You can just use Kiln Wash 80% + Diatomaceous Earth 15% + Graphite 5% as a very stable release that will work in presses as well. The narrow beads that I made with the “Lampwork Etc” Air Dry Bead Release Recipe. These beads are cigarette (or slightly longer) length. I still use this release regularly. The last Bead Release recipe I had in my notebook is one I found online. The general consensus on the Lampwork Etc forums was that this recipe was a good all rounder that did well in presses and cleaned off easily (this notebook dates to 2007, so I’m pretty sure the recipe isn’t on the forum anymore). The reason for the extra Kaolin and Alumina Hydrate in the recipe is to counteract generic Kiln/Batt Wash that might not have enough of either for stabilising beads. The teaspoon measurement gives you an idea of ratio, I usually multiply this teaspoon ratio by 4. I spoon each ingredient into a sifter with bowl beneath. Add a few clean marbles or a clean super bouncy rubber ball (optional) to your jar. Cap the bottle and shake really hard for a good five minutes it’s a great abdomen and arm workout. Five minutes seems long, but trust me on this… you need to mix it really well. Some people make a modified mixer attachment for their Dremel to mix bead release, other people put it into a blender. Whatever you do, make sure your release is mixed really well. If the consistency is thick and gluggy, add a bit more water and shake really well again. If the consistency looks like pancake batter, you’ve got it right. If the consistency is too watery, put the jar aside with the cap off and let some of the water evaporate. Bentonite + Diatomaceous Earth means release is easier to clean out of beads. The fine particles of Bentonite provides holding power but also separates the Diatomaceous Earth a little from the Kaolin in kiln wash making your bead come off your mandrel easier. 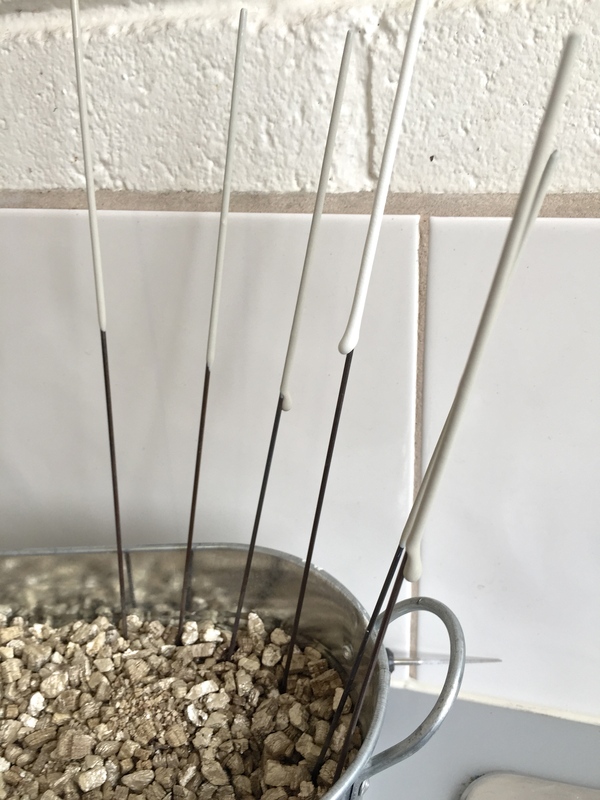 You can substitute your heaped teaspoon of Bentonite with a level teaspoon of Graphite if you’re finding it hard to get the beads off the mandrel or cleaned, but Graphite on its own doesn’t provide holding power. Graphite is a lubricant, so if you put too much, your release will always break when the mandrel gets cold and that is really frustrating. So err on the side of less is more when adding graphite to a bead release mix. Just add distilled water to fix up hard and dry release. Buy it from hardware shops or the cleaning aisle of your supermarket. I’ve had a lot of experience with screwing up my bead release, in abject desperation I bought some very expensive bottles from overseas. I still had problems, until I added kiln wash to the mixture I bought from the US. I was fairly epic in the way that in every single batch of dipped mandrels, most would turn out useless in the flame. Cracking, flaking, breaking, exploding off the mandrel and once, a spectacular shower of release once the flame hit the mandrel. You name the issue and I have managed to make it happen. The only true way of ending any issues with bead release is to prepare your mandrels and the mixture correctly. If you buy bead release it will most likely come to you in dry powder form (although a lot of American brands of release come to you wet), so follow the steps above for mixing bead release well and below for having clean mandrels free of residue which could impact the quality of your bead release. Don’t take shortcuts with cleaning and preparing your mandrels. You might not have a problem at all with your bead release. Save yourself the heartache of blaming your bead release until you can eliminate greasy mandrels. After all it might be that your mandrels that are greasy or dirty from being handled causing your release to prematurely crack or break. Or your bead release isn’t adhering to the metal surface properly, because they’re too smooth. Mandrels must be thoroughly scrubbed with soap and rinsed with hot water on purchase and after each use. Wear rubber gloves so oils from lotions and your skin cannot sit on the mandrel when you are cleaning them. Dry mandrels on a towel in a warm room or lay them out on a dish cloth in the sun. Resist the urge to “rub” them dry with a cloth. Store cleaned mandrels in a place where they won’t come into contact with anything (I have my clean mandrels stored upright in a coffee jar). Don’t handle your mandrels with your bare hands until you are prepared to dip them, ideally the end you touch should not be the end you coat in bead release. My mandrels are clean, dry and ready for dipping. Dip at a slight angle, it just works better. I don’t know why. There is a trick to doing the whole mandrel dip. The trick is; pull the mandrel out slowly and on a slight angle. The slower you pull the mandrel out of the bead release the thinner the coating is. Thinner coatings of a good consistency release will dry quickly and thoroughly, will be more stable in the flame and less likely to break or flake. You will also get a bead hole closer in size to the actual mandrel which makes it easier to explain to people buying your beads how big the hole is. If you dunk your mandrel in and out of the release quickly, you will get a thicker coat of bead release. In some cases this is good to know if your release isn’t watery, but if it is, be prepared for a lot of drippy mandrels. Some people double dip, and only some bead release brands allow that. If you like a thicker layer of release, double check or do some tests before double dipping every single mandrel. Take a clean mandrel without touching the end you want to dip and slide it into a just shaken jar of bead release. Let the mandrel sit above the jar for a moment whilst any excess release beads off. Jam your mandrel into a container filled with sand or vermiculite to hold the mandrel up without it leaning (gravity will move wet release). Let your mandrels dry out of the sun and any breezes. Some people like to sit their mandrels on their warm kiln if they’re in a rush and need them to dry quickly. Breathe out, now do at least ten more (or however many you think you’re going to use up in the space of three to five days). Some bead release can handle being dipped and left to sit for months and others can’t. As a general rule of thumb I dip about ten mandrels at a time because I use about that many in one torch session. When bead release is completely dry, look over your mandrels. If you see little rough edges where powder hasn’t dissolved properly you can gently “finger sand” your mandrels to smooth them out. The white mandrel is dry and the grey have just been dipped. Some have a drip line because I dipped it fast, you will only get those drips if you dunk your mandrel in and out quickly. Go slow! Bead release will look grey when wet and white when dry. In winter, with the studio warmed by the heater (dry air), I give my mandrels at least an hour of drying time before I use them. In Summer, because the humidity level is higher (moist air) I’m more cautious and tend to leave them overnight under the desk where they’re out of the sun and heat. I also use my flame dry release more in Summer, because all the releases I own really don’t like humidity. When your mandrels and release are all dry and your torch is lit and everything is ready to go, there is one last step on your road to perfect bead release and that is your flame preparation. Mandrels and release have to be heated gently, so that they can expand together in the heat without cracking. This seems like a no brainer and yet, the temptation to chuck the mandrel straight into the flame is high on my “stupid things I do” list. A bit of patience when heating your mandrels up will make a great deal of difference with how well your bead release performs in the flame. Remember, different bead release brands like to be heated up differently and that is due to their nature (flame dry release, needs to be very carefully heated) but as a general rule of thumb, the following can be applied to most brands of air dry release. I waft my mandrels in the top part of my flame to gently heat the entire dipped length of the mandrel. Then I rotate my mandrel through the higher part of my flame making sure every part of it has flashed red from heat (your release should also get grey “scorch” marks on it). In the case of using Super Blue Sludge or Dip’N’Go sludge you want the release to change from grey all the way to white. Before I apply my glass, I spot heat the area on the mandrel where my first wind of glass is going to go (your release should go white). I pull the mandrel back and forth to also heat around the spot area (so that the length of mandrel that will take the bead is also white). Then I wind on my glass. 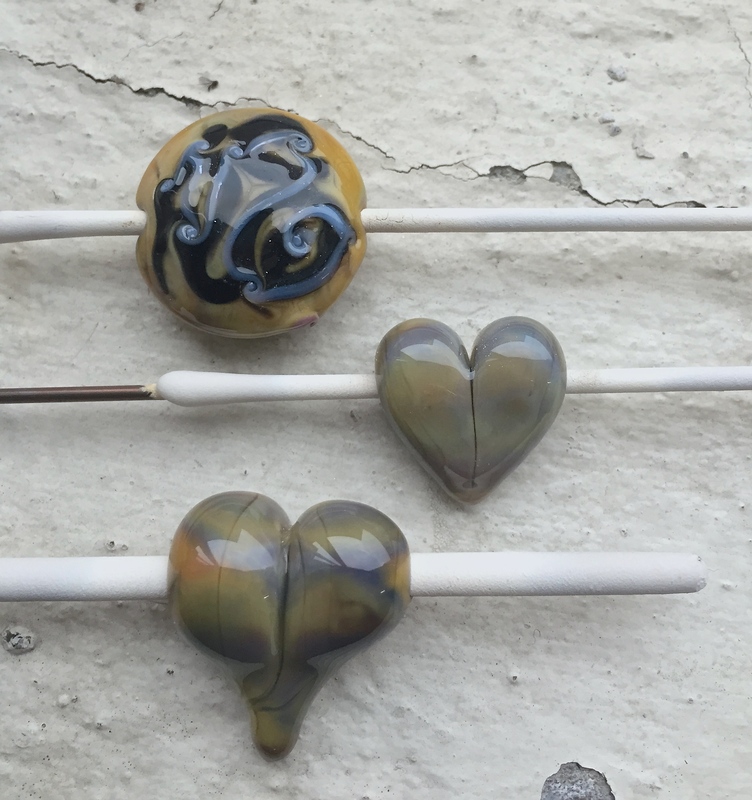 These beads have been put through the torch, then fired in a kiln. They’ll need to soak in soapy warm water for a half an hour before I pull them off the mandrel. This is a perfect example of why I go to all the effort with my bead release, no cracking!!! There was a lot of tugging and shaping of glass and the lentil was put into a press. If you do all of that in the flame, you have a much higher chance of perfect bead release that holds tight, doesn’t flake or crack, no matter what brand you are using. Its important the mandrel is well heated after the initial phase of introducing your mandrel and bead release to the flame. Your glass will not get air bubbles trying to rise to the surface of your bead from cold or moist release and your bead won’t suddenly “release” mid way through making it, (spinning bead syndrome) because a good heated connection was made. Lastly, do not spot heat so intensely that you cause your bead release to crack. You just want the release to be hot enough to take the first wind of glass for a good connection. It takes practice learning how much heat your release can take, some brands take a lot of punishment and some don’t. The “Lampwork Etc” recipe above is pretty forgiving, but moving the mandrel in and out of the hottest part of the flame a lot will cause it to release prematurely. A little trick I taught myself is the “two bucket system” (I’m giving it a fancy name). Basically, you want two plastic buckets, the kind that kids use at the beach placed in your sink or laundry trough (to contain any spills). One bucket should be filled with very cold water and one with warm (as warm as you can handle) sudsy water. The idea is to make your job cleaning beads and mandrels as easy as possible. Drop your mandrels with the beads still on them into the bucket of very cold water, the cold water will contract the metal just a fraction, making the beads easier to twist and slide off. It also means that the bead release along the rest of the mandrel will easily crack and slide off as well. You won’t have to scrub very hard to get the release off. As you’re twisting off your beads, have a bucket of warm sudsy water next to you ready so you can pop your beads into that bucket, where they can soak a little while. To clean out the bead hole I use a Dremel with a diamond reamer bit. If you don’t have a Dremel you can always use a hand held bead reamer to clean your beads in the warm water in the bucket. Set your cleaned beads aside on a dish cloth to dry. When you’re finished all your beads, using a cigar pipe cleaner (these pipe cleaners have stiff plastic fibres) run it through the bead holes to pull out any excess residue of clay and water, then leave your beads to dry completely. My “two bucket system” patent pending. Those cheap green scrubbing sponges are the perfect thing to clean mandrels. Lastly, when your beads are completely dry, run some clear nail polish through the bead holes (I learned this trick in a book) and that will make them nicer to photograph and also nicer to string up for jewellery makers. If you have a transparent bead and you’re having trouble trying to get the nail polish brush down the hole, another trick I taught myself is to thread a piece of tightly braided string (not yarn) and just paint the string in clear polish and slide the bead across it to get the clear polish through the hole. This is a list of bead release brands that I’ve either used or am using. Some of them come from Australia and others from the USA. Chockadoo and Beadglass ship their bead release flat in ziploc bags, but some, like Foster Fire ships out wet in sturdy plastic containers. There are heaps of brands out there, but these are the ones that I’ve personally tried and liked over the years or brands friends swear by. No other issue genuinely frustrates a bead maker more than when bead release isn’t doing what it is meant to be doing, this FAQ section may help you solve your bead release drama. What do I do if my bead release has dried in the container? Just add distilled water. For really dry releases (so dry that it’s crumbly or looks like hard pan clay), add distilled water and allow 24hours for the mixture to absorb it. Give it a bit of a stab with a thick mandrel and then keep adding distilled water (stabbing and mixing it) until you have reached the consistency you want. Bead release never goes off, you can keep resurrecting it. I’ve resurrected a completely dry jar of release that was as hard as rock, it took 3 weeks to do but it’s doable (and I use that release with no problems). Bead release will do this for a few reasons, flaking is usually due to bad adherence to the mandrel. Your mandrels might be new and not scuffed enough. Your bead release might be too thin and there wasn’t a thick enough coat to last in the flame. Some brands of bead release flake when there is too much moisture in the air or if they’ve been left to dry for a very long time. Cracking can be down to a few things as well, one of the main reasons is prolonged heating in one spot and marvering or squashing glass repeatedly. The extensive heating and cooling, expands and contracts the mandrel which causes bead release to crack. Cracks can also form if mandrels haven’t been introduced into the flame correctly and allowed to heat up slowly. Release will also crack if it hasn’t dried properly and was put into the flame too quickly. I use a tin pail filled with vermiculite (which you can get from a permaculture or hydroponic or gardening store). Some people fill a bucket with sand, others drill holes into a block of wood to stand their mandrels upright. When my mandrels are dry, I push them out on an angle to make them easier to grab, since I’m clumsy. You should expect some cracking in your bead release particularly if you’re heavy handed with marvering or using tools. I usually develop cracks or have my release flake if I’m being particularly tedious about marvering the edge of a bead. The constant pressure against cold graphite weakens the spot immediately around the edges of beads. I have gotten better with understanding which way I can move the glass on the mandrel without having the release crack, it’s practice. Your bead release will also crack less when you realise that you don’t need to work low in the flame all the time, working upward and slightly below the flame will ensure your release doesn’t overheat and start pulling away. The other thing I can tell you, is that you get better at understanding what consistency your bead release should be based on your environment. My “pancake batter” is on the thinner side in winter and thicker in very dry summers. Yours too will change depending on your circumstances. If none of these issues are causing your bead release to crack, then it might be the release itself. Sometimes the bag of dry mix you’re scooping from has settled and you don’t have enough of the ingredients mixed into your jar. I have had some success fixing up mixtures of release by adding a heaped teaspoon of superfine milled Diatomaceous Earth (links to the exact brand that I use) to the existing blend. The Diatomaceous Earth increases the holding capacity of the release and stops it from cracking due to cold and moist air or from using in presses. Also, check the bottom of your wet mix jar, if you can see a lot of settled content get in there with a chopstick and mix it all up and reshake your jar, adding water where necessary. For bead release to work properly it needs a good suspension of all ingredients. The stuff settling in the bottom is the clay component, without the clay mixed in properly you will get release cracking. You can sometimes fix a jar of wet release by adding either a bit of clay (such as Kaolin) or a bit of Diatomaceous Earth. One reason for why jars of mixture suddenly “go bad” is that over time of use, not shaking up the jar properly has caused an imbalance in your mixture, depleting some of the key ingredients whilst others settle at the bottom of the jar. Bead release needs to be dried properly before you can wind glass onto it. If you haven’t properly heated up your mandrel the moisture in the release will cause bubbles in your base bead. These bubbles will lead to a lot of internal stress. The bubbles will eventually cause fractures which means beads will crack further down the track. Go back through my post on heating up bead release and follow that, you shouldn’t get those tiny bubbles forming in your bead. If your release if frothy in your container it could be that something in there is fermenting. Smell test your release, if it smells vinegary throw it out. I think this happens when a large insect lands in your release. 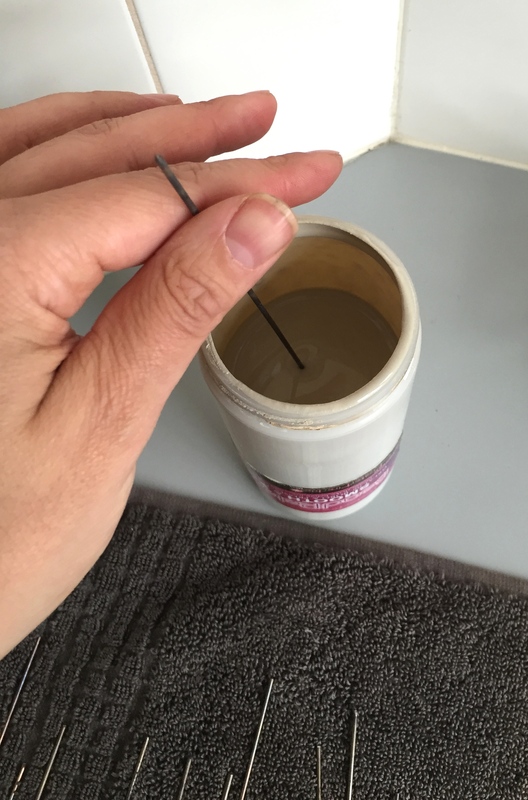 If there is no such smell and your release looks fine in the container but when it starts to dry on the mandrel the bubbles all begin to come up (so that your mandrel looks like an ‘aero’ chocolate bar) there was potentially oil or water already on your mandrel before you dipped it. If that wasn’t the case, the atmosphere might be so warm the bead release is drying to fast. Aaannnddd….If that isn’t the case, shake up your bead release mixture really well and dip again. If the same thing happens, add a heaped teaspoon of kiln wash or batt wash or your dry bead release formula to your container and reshake and dip another mandrel. Sometimes if your release isn’t mixed properly or there isn’t enough of the clay component suspended bubbling up as it dries can happen. If you have any problems that are really persistent, drop me a message with an image of your problem release on a mandrel. I’ve had so much drama with bead release over the last ten years I could probably help diagnose the problem.